Wave= a rhythmic up and down or side to side motion.Energy is transferred from one particle to the next through waves. Waves come in two forms: transverse and longitudinal. A transverse wave occurs when the particles in the wave move perpendicular to the direction of the wave's motion. When you jiggle a string up and down, you create a transverse wave. Longitudinal waves occur when particles move parallel to the direction of the wave's motion. Sound waves are examples of longitudinal waves. A good way to visualize how a sound wave propagates is to imagine one of those "telephones" you might have made when you were younger by connecting two cans with a piece of string.1 When you talk into one of the cans, your vocal cords cause air molecules to vibrate back and forth, and those vibrating air molecules hit the bottom of the can, which transfers that back-and-forth vibration to the string. Molecules in the string get squished together or pulled apart, depending on whether the bottom of the can is moving back or forth. So the inside of the string would look like Figure 23.2, in which dark areas represent regions where the molecules are squished together, and light areas represent regions where the molecules are pulled apart. The terms we use to describe waves can be applied to both transverse and longitudinal waves, but they're easiest to illustrate with transverse waves. A crest (or a peak) is a high point on a wave, and a trough is a low point on a wave. The distance from peak-to-peak or from trough-to-trough is called the wavelength. This distance is abbreviated with the Greek letter λ (lambda). The distance that a peak or a trough is from the horizontal axis is called the amplitude, abbreviated with the letter A. The time necessary for one complete wavelength to pass a given point is the period, abbreviated T. The number of wavelengths that pass a given point in one second is the frequency, abbreviated f.
If you take a string and jiggle it just once, so that a single peak travels along the string, you generate a wave pulse. A standing wave occurs when you connect one end of a string to a wall and hold the other end in your hand. As you jiggle the string, waves travel along the string, hit the wall, and then reflect off the wall and travel back to you. If you jiggle the string at just the right frequency, you will notice that the string always looks the same, as in Figure 23.5. This is a standing wave. A wave moves a distance λ in a time T. So the velocity at which a wave travels is just distance over time, or λ/T. 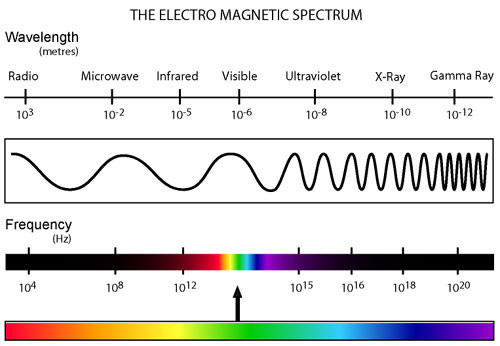 For sound waves moving through air at room temperature, v = 343 m/s; for light waves in a vacuum, v = 3.0 × 108 m/s. Don't memorize these speeds; just be aware.